I went on an audition for an indie film called 3 Weeks to Daytona, directed by Bret Stern, an upcoming director who has a keen eye for dynamic filmmaking. It was cast by Adrienne Stern and I got the part in this Nascar racing flick which was set to film at the Waterford Speedbowl, a Nascar sanctioned track in Connecticut. But my first scene was at a sound stage in Norwalk, Conn. I play the part of Buddy, a cocky and talented driver, a real poser. Buddy acts as nemesis to fellow driver Chuck Weber, played by Scott Cohen, a down on his luck limo driver, but wannabe Nascar racer who is plagued by the memory of an absent father. The void in Chuck's life is filled by his pit crew chief, played by Jorja Fox. He also has a son who he desperately tries to impress by finally winning a race after many years of unsuccessful attempts. Chuck under his wing at an early stage in his life as well as his career as a race car driver. 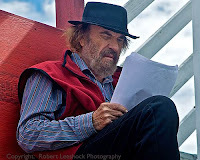 I show up on the set my first day, look at the call sheet and notice that Rip Torn is playing the racetrack vet in the film.... I'm thinkin' this could be cool and I congratulate the director and producer for being able to snag Rip Torn to do the part. Rip shakes my hand at one point during our introductory scene and wants to Indian wrestle, sort of a toe to toe, balance contest, where you try and rock the other guy off his standing position. I gather very quickly that this guy is true grit personified....tough guy, old school, kinda reminds me of my dad and my grandfather all rolled into one. I mean this is rich....my dad's dead about 10 years and here's this guy who practically channels his essence as well as every other 'tough guy who doesn't dance' Norman Mailer type character I have ever read. He's a classic Sam Shepard character, one I dreamed of playing as a young actor. Torn had done quite a few of Shepard's plays I recall. I mean, this is the actor's American landscape I envisioned when I rode my motorcycle around the country 23 yrs ago to soak up the essence of the quintessential archetypes I had hoped to portray. And I am in a scene with one of 'em...very cool. Scott Cohen, who plays Chuck and I defer to the venerable old chap. Rip has mentioned to both the hair and makeup people that he has done about a hundred of these types of films before so he basically sets the tone for everyone on the set. He also feels at liberty to direct Scott and me a bit for the confrontational part of the scene. Bret, the director is mild mannered and soft spoken, a real likable guy who allows the scene to organically unfold and he lets us find our way. When Rip delivers, he's brilliant!! He's like a V8 engine, throat rumbling on all cylinders. My scene is over pretty quickly. As I leave for the day, I mention to the production that I will be driving up to Conn. the next time I'm scheduled to work and would be willing to pick Rip up from his apt. in NY and give him a ride if it would save them a trip. I also think it would be a golden opportunity to shoot the crap with the guy. He must have a lot of stories. I show up at his apartment in my humble Honda early one morning around 7:15 am and he doesn't recognize me. He tells me to move my crap from the backseat so he can put his crap there before we head anywhere. It's not until 10 minutes later on the Westside Highway that I remind him that we had a scene together a few days ago and he apologizes and tells me, "If I had known that, I woulda come up in front with ya." But he tells me he has to work on his lines. Alright, we'll chat if and when he's ready. I've been driven to a few sets, sometimes you just wanna be grumpy and get some work done. He actually doesn't read his lines, but starts to fill me in on some of his history. Random snippets of stories come from the backseat. One is of him enjoying a meal with his family years ago and a bullet coming through the window of his apartment while they sat for dinner. He points out the cowardice of a man who wouldn't have the guts to meet him face to face in the street. I conjure up visions of Charles Bronson and Clint Eastwood from classic tough guy movies. He mentions Norman Mailer and he also mentions the 1964 civil rights killings in Mississippi. And with regard to the dead activists, he relates how he discovers while on a fishing trip down south with some locals, the inside skinny of the location of their unrecovered bodies. It's not a linear story and I struggle to fill in the missing pieces. We get to the set at the Waterford Speedbowl. I randomly remember the words of my own dad... he used to have a saying which could have come out of a Sam Shepard play, usually after a bout of drinking..."It's only a game...we're only here for a little while!" I used to think it was a cynical response to the world, maybe even a cop out, but now I have grown quite fond of the adage which now just means that we must take advantage of our short time here on this planet... this (parenthesis) in time... and it really doesn't matter much whether you're at the top of the list or somebody's driver, we're all just playing a part, workin' it out. John Viener plays the part of Rob, an accomplished furniture store owner and race sponsor. As an actor, he hopes to infuse his scene with some off the cuff improv and he's clearly capable. With Rip, it's snippets of brilliance and I soak them up to the point where I am repeating the lines days later. "It's Daytona, where real men only turn left." I have brought my camera to the set and hope to document some of the filming and Rip is willing to have me shoot him. But at some point, he whispers for me to back off a little... He shares a glimpse of his own humanity as he tries to get ready for his following scene. I fondly regard his renegade spirit, a reminder of my pops and grandfather... bygone generations of tough guys. And I can't help but think of how he and all of us 'struggle' from time to time. But as the road whizzes by, there's a sense of consolation when driving...whether it's a Nascar racing machine or an '01 Honda with Rip Torn in the back, really..."It's only a game...we're only here for a little while."